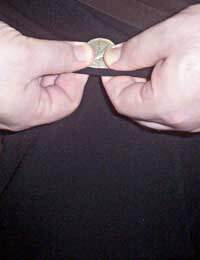 A great coin trick that can be done anywhere at anytime - as long as the magician is wearing trousers. The magician borrows a coin from a spectator and examines it, declaring it counterfeit. At the protest of the spectator, the magician endeavours to prove that it can’t be a normal coin by laying it against his leg and covering it with a fold of his trousers. Almost immediately the magician reaches behind his leg and lets go of the trousers, showing that the coin has vanished and appears to have passed through his leg! The trousers provide the distraction and a finger palm provides the method for the vanish. A pair of trousers made of material loose enough to make a fold of cloth is required. No advance preparation is needed to make a Coin travel Through a Leg. This effect is great when performed in conjunction with a number of other coin tricks, perhaps as the lead into a whole series of “funny behaviour” with the coin. A borrowed coin works wonders, but if none are readily available the magician can provide his own coin. A new, shiny coin works best, especially if the trousers worn by the magician are dark. The magician produces the coin and begins his patter about the oddness of this particular coin. Holding the coin in the right hand, the magician lowers it to his side, next to his leg. Moving the coin to his thigh, the magician presses it against the material of his trousers with his right thumb. Moving his left hand over to join the right, the magician should now press both thumbs against the coin. With the fingers of both hand, the magician pulls at the material of his trousers, gathering up enough cloth to fold over the coin. The magician now folds the material of the trousers over the coin, pinching it between his thumbs and fingers, with the material in between his fingers and the coin. At this point there should be enough cover for the magician to use his right thumb to slide the coin into his right hand, right into a finger palm. Slowly and deliberately, the magician now pulls his right hand away, with the coin cleverly concealed in the finger palm, and reaches behind his leg. The magician can simply let go of the cloth of his trousers, which will fall back into line smoothly and reveal that the coin has vanished. At this point the magician pulls the coin from behind his leg, making appear as if it has magically moved through the leg itself. A pair of dress trousers of the “no press” variety work well, as the material will fall smoothly back in line without a crease. A waiter doing pub magic and wearing an apron can use the apron for this trick just as well. This Coin Through a Leg can be used to make any small object vanish, but coins work the best, as the key move of sliding the object into the finger palm can be problematic with a rough or oddly shaped object.